Fetzer Architectural Woodwork made the most of its move. Improving the layout and the manufacturing flow in a new location was the goal for the maker of architectural woodwork, store fixtures and library furniture. "We saw growth opportunities for the company that could not happen in our previous facility and we wanted to capitalize on those opportunities," says Erik Fetzer, vice president, operations. "Our machinery layout was also restricted in the old facility and we wanted the benefits of a new layout." The move to the new building, completed in July, allowed Fetzer to expand capacity without adding more machinery. Raw material is received on the south end and finished goods are shipped out of the north docks, with milling, assembly, finishing and final assembly in between. Workflow has improved tremendously in the new building, providing visibility to everyone working on a specific project. Before determining the layout of machines in the new plant, Erik Fetzer looked at the existing bottlenecks in the old plant. A routing program analyzed delays, how many hours a day machines were busy and how much work went from one machine to another. "That analysis gave us the relationship between machines," Fetzer says. "Sometimes it was 60 percent from one machine to another, and 40 percent to a third machine. We knew we had to have the edgebander close to the CNC machine, for example. After we found the relationship between machinery, we were able to lay out the building and machinery. It wasn't based on someone's gut feeling. We used the data to tell us where to put the machinery. The physical layout between departments is also much better, with holding areas between departments." The old plant was 97,000 square feet. The new location has 120,000 square feet of manufacturing space and 13,300 square feet of office space. The new plant is on a hill in West Valley City, has a nice view of downtown Salt Lake City and mountains to the south and west. The new building also features some aesthetic touches. A timber frame surrounds the front entrance and a Frank Lloyd Wright quote adorns the building's exterior. The offices include makore walls, bamboo floors and rosewood panels. A skylight in the office allows viewing of veneers in natural light. Inside the plant, there are daylight skylights and T5 fluorescent lighting, which adjusts to provide more illumination on cloudy days. A new 150hp MAC dust collector was purchased for the new building, and an existing Torit dust collector was moved from the old location. Fetzer Architectural Woodwork makes both large premium-grade architectural woodwork packages and custom store fixtures. About half of Fetzer's work is millwork, and half is store fixtures. "Our niche in the retail fixture market is the top segment that demands the highest in craftsmanship and quality," Fetzer says. "When you're dealing with this portion of the market, the fixtures are more like fine architectural woodwork." In fixtures, Fetzer makes custom wood panels and trim, perimeters, back walls, showcase islands and specialty cases, using veneers and integrated materials, metal, glass, stone, plastic, lighting and electrical communications. The company also makes reading tables, carrels, chairs, book trucks and shelves for libraries, including large runs of high-end, custom furniture often produced in conjunction with an architectural woodwork package. 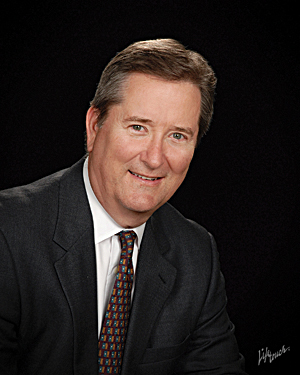 "Fetzer definitely is a store fixture company and we like being that," Erik Fetzer says. "But we wanted to diversify so we weren't held captive by the ups and downs of the store fixture market." Architectural drawings are refined in AutoCAD and Solidworks to produce shop drawings. An in-house design team helps customers. An ERP software package from Infor called Visual Enterprise incorporates all aspects of the company from time collection and financials to manufacturing flow. Bids from estimators are turned into work orders in Visual Enterprise. There are 60 active jobs in the plant at any one time, and 10 to 15 work centers. The store fixture cell is now on the plant floor and is integrated with the rest of the plant. Work order routings are created for Shop Visual View. That tells the system which machines a work order has to pass through. The company made an effort to set metrics and achieve them, control overtime and improve delivery time. Also, Fetzer had to get over the idea that their business is unique. It's similar to other businesses. "That was a big cultural change," Fetzer says. "The process and equipment are different but we are doing the same overall functions as other manufacturing. The goal is to standardize processing. "We are working on a process control system that will help make sure that everything is complete and marked, labeled and identified. 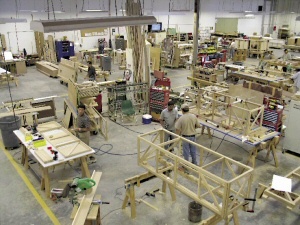 The goal is to have both store fixture and millwork jobs handled the same way. The amount of information that we have to keep track of is so large we need a process to keep it under control." One of the biggest changes in the new location is the addition of a panel processing line. Previously, Fetzer was subcontracting out all plastic laminate work, but as other cabinet manufacturers have become busier, they are less able to handle that extra work. "Our systems before were so poor on laminate, it made sense to have that work done outside," Fetzer says. "Now, we're developing the systems to make our process more technologically advanced." 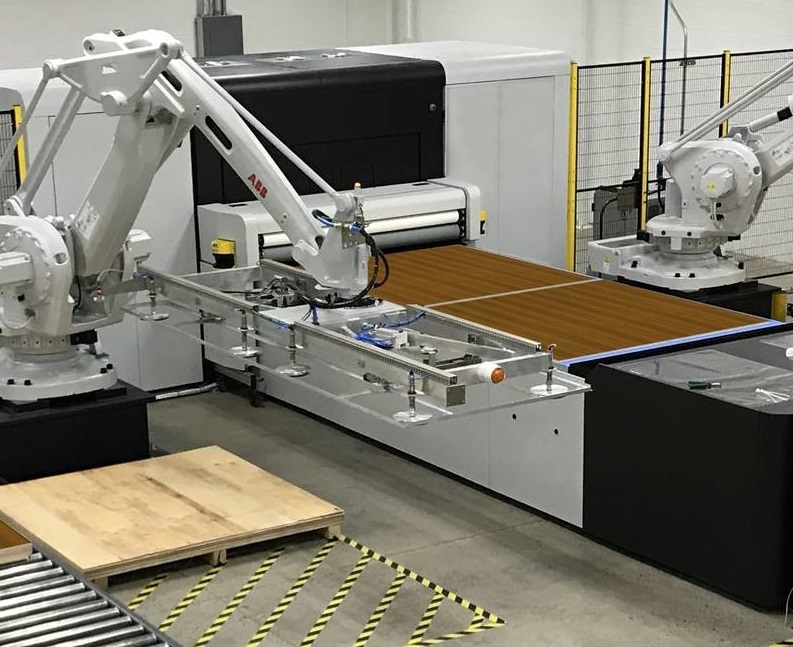 The new panel processing production area will include two Schelling panel saws, along with a Holz-Her Accord 1468B edgebander, an Accu Systems dowel inserter, Ligmatech MPH40 case clamp and a new point-to-point. Fetzer's veneering capability includes a Josting veneer guillotine, Savi cutoff saw, Kuper splicer and Diehl veneer splicer. Humidity in the veneer area is kept at 45 to 50 percent to help the veneer lay flat. The Utah humidity can go as low as 5 percent so Fetzer purchased a new ML Systems' humidification system at IWF. A Swiss-made Steinemann top and bottom calibrating sander eliminated three handling steps and was a major addition. Pieces are prepared for veneering, better adhesion and more consistent thickness of core material. Pieces of MDF go from the saw to the Steinemann sander, then through the Black Bros. glue spreader and a Sennerskov veneer press. After the veneer press, veneered pieces go to a Torwegge double-end tenoner for both tenoning and trimming of veneer. Some pieces may go to an IMA edgebander at this point, then to one of two routers. A Shoda CNC router is used for nested and flat panel work. A Weeke Optimat BHC 350 machining center is used for hardwood and cabinet-type parts. Other equipment in the plant includes a Diehl rip saw with automatic fence and a Doucet return table, Wadkin moulder and a Weinig Hydromat H23C moulder. The finished machining function includes large assembly and holding areas. A Heesemann sander in the middle of the assembly area is the last step in finished machining. Work scheduled for different areas can be viewed on a large television screen. "People on the floor can see the workload given to other people that's fairly new," Fetzer says. "We are hoping to have much more information down the road." Spray booths, track and drying tunnel were all provided by Global Finishing Solutions and brought from the old location. Fetzer discovered that higher volume doesn't translate into higher profit. Typically, volume outpaces profitability, and they have to give some profit up to keep a rapidly growing customer base happy. Fetzer compared its own sales per employee with the FDM 300 average, and discovered that they are achieving higher than that average, more than $200,000, in fact. That's a good way to start in the new location.